When approaching the task of designing a new office, we need to remember that designing is not synonymous with decorating. Designing should change employee behavior – not just change aesthetics. If you examine all of the tasks that happen within a workplace – they should all boil down to one of the following: Focus, Team, and Share. Focus is an individual work mode that occurs within a primary workspace that supports concentration and reduces interruptions. 2 .Share is a collaborative work mode that can occur in individual or group spaces and centers on the casual exchange of ideas with a mall number of colleagues. 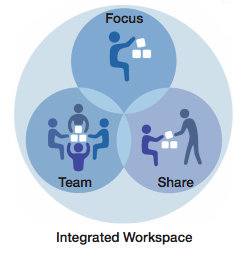 3.Team is a group work mode related to specific work goals that occurs in formal and informal meeting spaces. Optimize layout and location of workstations and offices to enhance visual access. Create a variety of work activity zones to enhance chance encounters.